Highly Commended at 2012 BMA awards in Medicine Category. This comprehensive, clinically oriented full-color resource offers you a wealth of detailed information on the diagnosis, treatment, and management of allergic diseases—from asthma to urticaria. 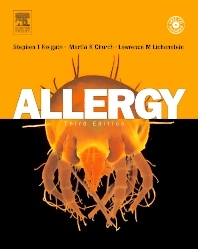 Thoroughly updated to reflect today's knowledge, this 3rd Edition features all of the latest developments in allergy and immunology. Plus, a consistent, logical organization puts vital information at your fingertips. Features abundant algorithms that provide at-a-glance assistance in identifying the allergic conditions you encounter in practice. Offers in-depth information in a chapter dedicated entirely to asthma. Provides valuable treatment protocols that assist you in prescribing appropriate therapies and effectively managing patients' allergies. Includes extensive references that point the way to the key works in the literature.